New Plymouth’s only motel by the beach and only a 2 minute drive to the CBD. it is ideal for travellers who like to be handy to town & CBD during the day but like to relax and unwind and take a walk along the beach in the evening. These spacious,comfortable one bedroom units with modern and elegant furnishings feature a couch and dining table and chairs. Suitable for up to 3 people, there is a queen or king size bed in the bedroom and a single bed in the living area plus, a 32"TV with Sky select in the lounge and a 19" TV in the bedroom. 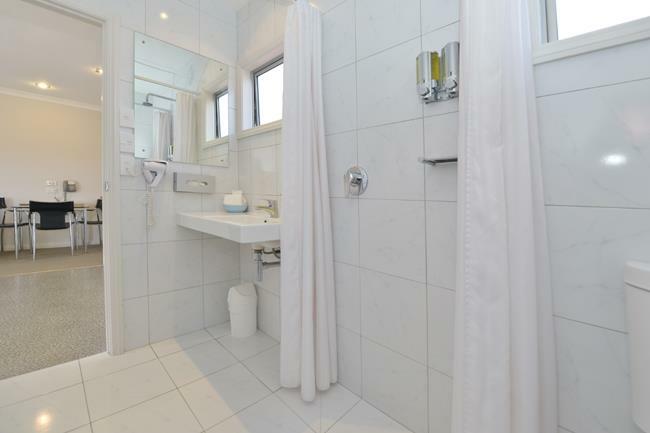 The large, modern and fully tiled bathroom includes a shower and heated towel rail. The stylish kitchen is well equipped and includes a microwave, dual hob and extras such as filtered drinking water and plunger coffee. These units are ideal for couples having a break or business travellers. Stay in luxury in a modern and spacious one bedroom deluxe room. The light and airy bedroom features a king size bed and a king single with rollaway in the lounge. The room is beautifully furnished with modern seating, dining table and chairs. Enjoy a 32"TV with Sky select in the lounge and a 19" TV in the bedroom. Relax in the the air-bath in the spacious, fully tiled bathroom. The stylish, modern kitchen is well equipped with a microwave, dual hob and oven plus extras such as filtered drinking water and plunger coffee. Treat your partner to a special weekend away or rest and recover in luxury on your business trip to New Plymouth. 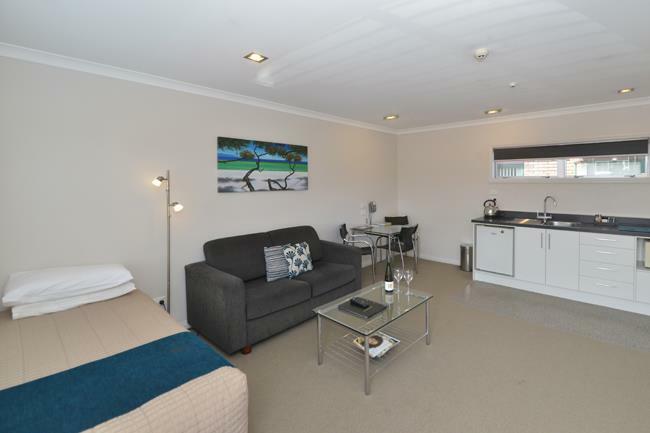 If you're spending a few days in New Plymouth this apartment is a great option. Large and roomy it features a king bed in the bedroom and 2 single beds in the living area and you can enjoy a 32" TV in the lounge and 19" TV in the bedroom. A modern, spacious, fully tiled bathroom includes a relaxing air-bath with shower over top. A separate kitchen is fully equipped for all your needs and includes an oven & hobs, microwave, filtered water and plunger coffee. Great for families and groups. For groups of family or friends our spacious, modern self contained two bedroom units are perfect. Featuring a queen bed in the master bedroom and two singles in other bedroom plus a 32" TV with Sky guest select in the lounge and a 19" TV in the master bedroom. The generously sized bathroom is modern and fully tiled and includes an air-bath to relax in. The modern, stylish kitchen is fully equipped for all your needs and includes a microwave, oven, plus filtered drinking water and plunger coffee.